Hello folks, my girlfriend just moved in and she's thinking of buying a used FZ6. We're going to go check one out, possibly tomorrow. I was wondering if anybody knows of anything I should particularly look out for other than the usual used bike checklist. How much and how many miles? An FZ6 is an iconic bike. You're a lucky guy. Had an '06 for a number of years and many miles before getting the power bug and buying the FZ1. Fantastic bike that was really unloved when it was new, but is really coming into it's own in the past few years. Definition of an all around bike, whatever you want to do, it can. Even took it down some rocky trails by accident a few times. Only suggestion I have is to get an '07+, they made a number of positive changes with the revision. Four piston front calipers, forged swingarm, revised front end and gauges, can't remember anything else. As far as what to watch out for, almost nothing outside of the norm. To date, it is the most reliable bike I have ever owned. Steering bearings wore out, and I had a small oil leak from the shift rod input cover. The oil leak was fixed by removing the cover, cleaning the gasket, and torquing it back down. I can't remember any other non maintenance repairs in the 120k km's I had on it. 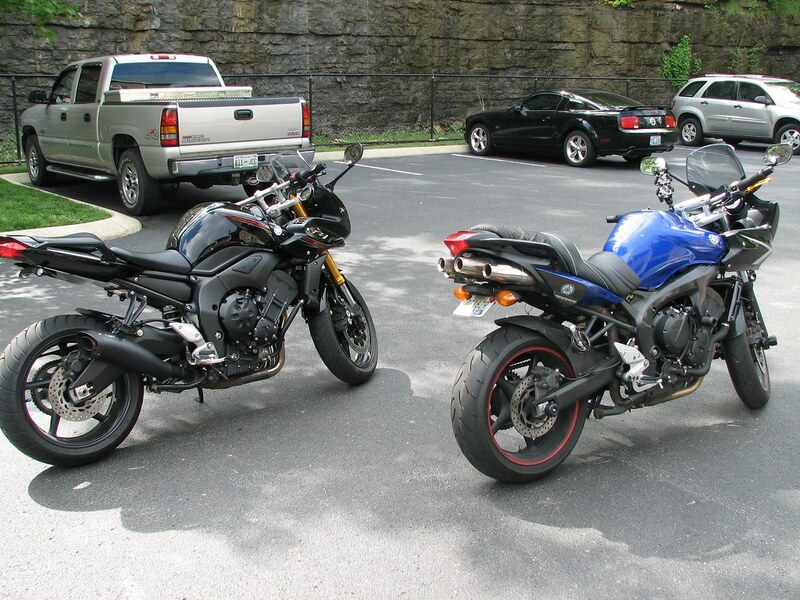 I have had a couple of FZ6s, they are extremely reliable and solid bikes. They also have more power than I thought it would. Just don't get an FZ6R. Loses about 30 HP and 3K revs. We got her a 2009 Grayish blue FZ6 (not FZ6R) with almost 16k miles on the clock for $3k. Bought it from the original owner who set it up for touring but only rode in a 150 mile radius. Has a GPS and Shad side bags. The owner never changed the coolant in it so did that last night. It was nasty. Mostly green but yellowish. Chain is in great shape, needs tires which I will put on this week. Will probably change spark plugs as well since I doubt he did that either. I'd put up a picture but don't know how. Sounds like a sweet bike, and good for you for putting new tires on it right out of the box. See what else you can do to upgrade her suspension (the bike, that is). Post some pics when you can. Nice! She'll love it. Pretty much a bulletproof bike. I had one as my first bike and still think fondly of it and wonder where it is now. I can still picture the young punk that rode off on it after buying it and thinkin, yeah you'lll dump it in a week. Got it inspected and registered today with the bad tires on it. These VA gas station repair shops will pass almost anything through inspection. Old cracked tires, and off we go. Getting the new tire today, will install tomorrow. Pic came up just fine, great bike and excellent purchase, congrats! loved my '04. definitely needed a power commander, helped smooth out flat spots and increased my fuel mileage nicely. until i came across a killer deal for my fz1, i was set on keeping that fz06 for a long time. great bike. I had a gen 2 fizzystix for a while. Competent reliable bike with a great revvy motor. Worst clutch I've ever had on a bike, though. Didn't bother me so much as a 20-year rider, but the low-torque motor and exceedingly narrow clutch friction zone make it not very beginner friendly. Also, I hated the way it looked. But can't fault it as an overall package. Well, she seems to love it and doesn't mind the clutch or anything. She loves that it has more power than her old Ninja 500R even if she doesn't want to use it, she loves having it. Starting to experiment with the rev range too. So overall, she seems happy, and when she's happy, I'm happy. Oh well it has the revs! and 96HP. Truly an underappreciated bike. Great little sport-tourer too and a screamer to boot. I was looking for a FZ6 when I found a deal I couldn't pass up on my Gen1. Yeah the previous owner set it up for touring but only rode to DC and back once. Other than that, stayed in a 150 mile radius. So the bike came with crash guards, highway pegs, Shad hard side cases and a Garmin nuvi50. Swapped out the Garmin for a phone mount (prev owner bought a ram mount for it). Installing the Garmin on my FZ1 this weekend. Put on a usb connection for a phone charger. Cleaned chain, changed coolant, swapped the tires (Battlax Hypersport front / Pilot Road4 rear) Ready to go. Went camping last weekend, bike held up great, no problems at all. I believe so. Already got the FZ6 so it can die.